smalti, natural stones, fired and glazed ceramics, lithographic stones, glass, plaster, grout, artist oak frame, 94 1/2 x 59 x 3''. 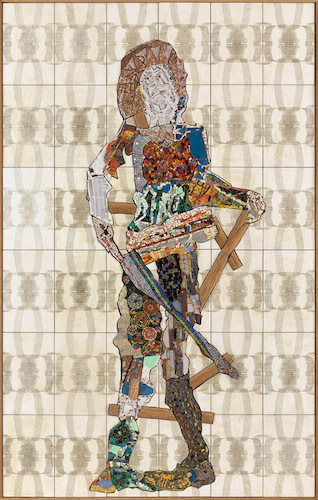 Working across a range of mediums and practices, Peter Linde Busk channels classical and popular culture to conjure protean figures and mythological narratives in his first solo exhibition in the US, “Any Port in a Storm.” Many of his multifaceted works, which include mosaics and reliefs, are assembled like intricately interlocking puzzles. Linde Busk creates these patchwork objects primarily with detritus salvaged from the studio, such as cardboard and wood scraps, tile, lithographic stones, and broken shards from his own ceramics. He coats his ceramics with a matte white glaze that settles into indentations and fingerprints like milky puddles. In Rosebud and We All Have to Decide for Ourselves How Much Sin We Can Live With (all works cited, 2016), the clay is flattened and carved into like a stone tablet. Both are fractured by large cracks that add to their air of antiquity. Similar to Arlene Shechet’s metallic-gray vessels from 2007, other ceramics evoke respiratory organs or musical instruments, as in Charon’s Call, which resembles a bagpipe. The exhibition is anchored by three monuments to feminine symbols of power: the artist’s version of the Venus de Milo, Penthesilea, the Amazonian Queen, and Sister Ray, the latter of which is named for the Velvet Underground’s smack-dealing drag queen antiheroine. Each piece is rendered with varying techniques, but they all feature the same central form—a gaunt figure in contrapposto with one arm extended, perhaps holding a weapon. We may never know what the original Venus de Milo was doing with her arms, but it’s safe to say Linde Busk’s spectral beings have axes to grind. Many of the artist’s titles quote literature and TV shows, which can lead to moments of heavy-handedness. But they do nothing to impede the evocative and eclectic visual world the artist has forged.